The title of this blog post is inspired by an Ice Cube song from a few years ago called "Go To Church." The West Coast rapper provocatively taunted (with the help of Lil Jon and Snoop Dogg) that "if you're scared, go to church, go to church." The lyrics from that song couldn't be further removed from the tone of a luncheon I attended last week. But that one line, "if you're scared, go to church," popped in my head just now because that's really what city officials were hoping to do--get clergy to resolve the fears of their congregations over affordable housing. I attended the Clergy Lunch on Affordable Housing last Thursday at Covenant Presbyterian Church Fellowship Hall. Organized by Mecklenburg Ministries, the luncheon featured City of Charlotte officials to address the need for more affordable housing in the area. The purpose of the meeting was also to help diffuse some of the scare tactics and the misinformation about affordable housing that has been spread in Charlotte recently. Communities like Ballantyne and Ayrsley have made headlines this year in successfully keeping those housing units from being built in their neighborhoods. 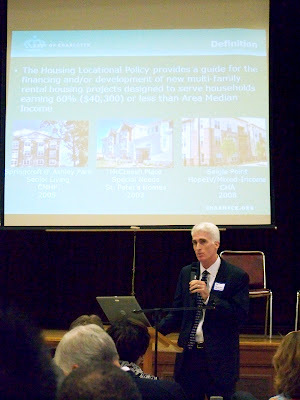 Go to CrossroadsCharlotte.org, to read my coverage of the luncheon: "Clergy Lunch on Affordable Housing Sparks Conversation."